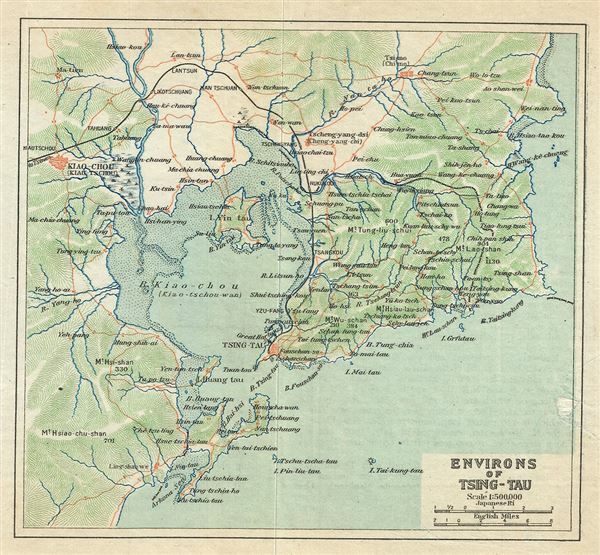 This is a beautiful 1924 map of Qingdao or Tsingtao or Chingtao and its vicinity, located in the eastern Shandong Province of China, issued by the Imperial Japanese Government Railways. The map depicts the city and its vicinity, an important sea port and naval base and China's most livable city, in great detail, noting towns, rivers, railways, and other topography. This map was issued as part of the 1924 Official Series Vol. D of the Guide to China and printed at the Toppan Printing Company. Very good. Minor wear along fold lines. Minor verso repair over damage near right border.